For anyone who's been to Dublin or even just googled images of the city, you've inevitably seen photographs of the famous Georgian Doors. Bright blues, vibrant reds and even a pastel lavender and olive green all make for a beautifully colorful pop amongst the brick buildings. What could be a dreary, blah-like road is transformed into something that's just a bit more fun and unexpected. I think we've covered the ROY G. BIV acronym here! My son, Harry, & I took most of these photographs over two separate occasions into the city. He got such a kick walking up the steps and seeing all the colors of the doors. We often sing a song about colors called "I Can Sing A Rainbow" and it seemed appropriate to sing it while we walked. 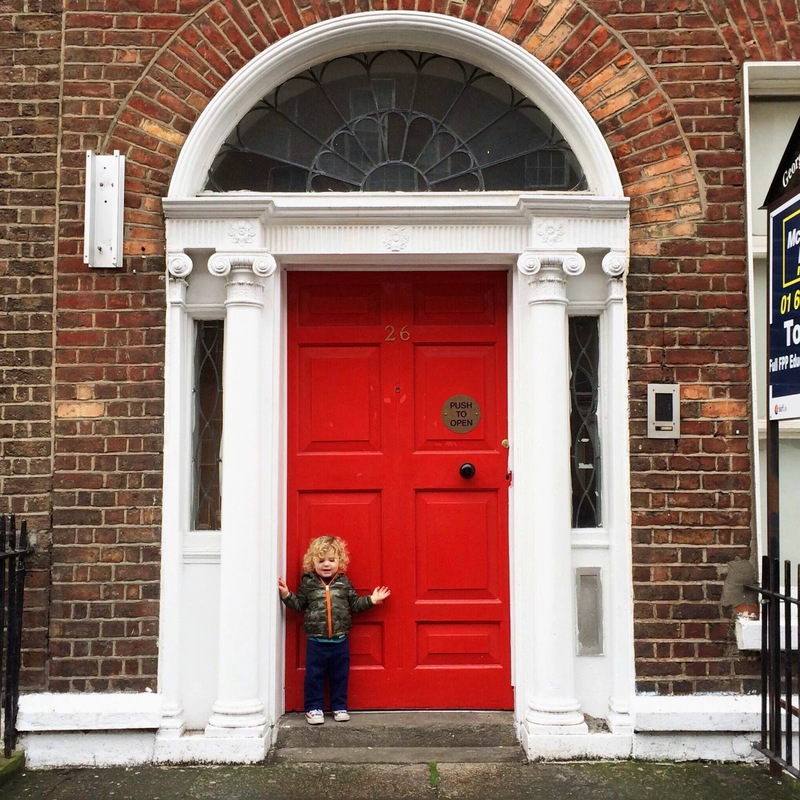 If you aren't sure where to look, try Leeson Street, Merrion Square, Harcourt Street and Fizwilliam Square for roads where you can find some of the best examples of a colorful Georgian door. I'd love to hear your stories about how you help your children learn their colors. What kinds of games do you play? Do you sing any special songs? I can't wait for my next visit into Dublin to snap some new Georgian doors and find some new colors to add to our collection of photos! I would make these photos into flashcards, for those rainy days looking for something to do inside. Plus flashcards can be handed down for future generations! you could even put numbers on the cards, double learning and the kiddos don't even realize it! What a great way to learn colors. I taught Kati how to count by going up and down the stairs everytime. One day I didn't count and she started. I remember you telling me that story when you came to Chicago when Harry was born. Ever since then, we count every single step!! !